We are very excited to share our most recent interview! It’s with one of our own, Livible CEO, Terry Drayton, who recently moved. We wanted to learn a little bit more about how he found the moving experience to be – and what better than to ask a true expert in storage! Terry Drayton is a pioneer in seeing what’s possible and turning that into world class businesses. He has a particular interest in technology, including the latest and greatest in mobile apps and cloud services. When asked about what motivated him to start Livible, he mentioned products and services which his very own family could use. And that is just what he did in his recent move! Tell us a little bit about your recent move! Why were you moving and what was the most exciting and most difficult part about moving? One of the reasons we originally started Livible was to allow us to downsize. We wanted a smaller, simpler house – without formal living and dining rooms that we never used, fewer bedrooms and a smaller, lower maintenance yard. Of course we appreciated that a smaller house also had lower property taxes, utility payments, etc. so our cost and complexity went way down. After talking about it since our youngest went away to college two years ago, we finally made the decision to move this summer when our eldest graduated from college and got a job in San Francisco. With no chance for the millennial move back, it was time! We sold our great family house quickly and then got lucky finding our new place in the neighborhood! What items did you pack first? Why? First up was the “decluttering” process orchestrated by our fantastic realtor, Wendy Lister and her team. That was removing all the personal items to make our house easier to sell. We also removed a lot of items from our storage room and garage including decorations (Halloween, Thanksgiving and Christmas) and some sports equipment (skis and snowboards). We ended up with 28 containers and 6 oversized items, mainly for snow sports! What items did you pack last? Why? Last was after we’d sold our house and before the movers came when we cleaned out the attic and the garage. It’s the items we’d forget about and haven’t touched since our last move 12 years ago. We ended up donating a lot of stuff to our partners at Value Village. We did it last as we wanted to get the house ready for the cleaners. Explain how you used Livible to assist you in your move? We couldn’t have done it without Livible. Some of that was knowing we didn’t have to deal with all our items right away. A great example is our library, where we didn’t have time to sort through all the items, so we packed hundreds of books into 15 containers. In a few months we’ll get them delivered to our new place and sort through them then! Another was knowing we have a permanent, inexpensive “store room” that we can have delivered at any time. 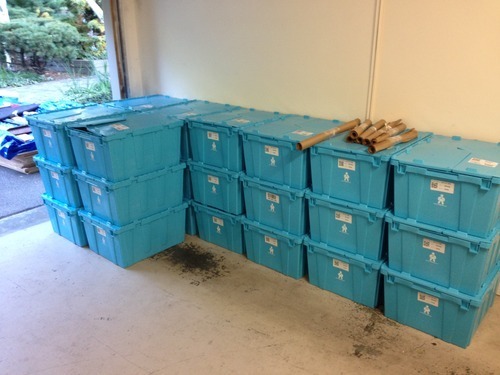 We have 97 items in storage that’s costing us about $200/month, which is less than renting a self-storage unit. Plus we can get next day pickup and delivery! That allowed us to purchase a smaller place that we would otherwise have needed. Any tips you could offer fellow movers? If you use Livible, and our mobile application, take pictures of the items before you put them into the containers, use folders and do one room at a time. Folders are an easy way to organize groups of similar items. It’s particularly easy to get them redelivered as you can just click on the “all” button. The key is to complete one room at a time instead of spreading yourself all over the place. There is a great feeling of satisfaction as you empty a room. We did multiple pickups of 15-20 containers, which helped us see what was left. Follow us on Twitter and Facebook for more on Livible.